Brain Sentinel launches its SPEAC® System to the military community providing a new tool for seizure monitoring when EEG is not feasible. Brain Sentinel has entered into an exclusive partnership with Academy Medical, a recognized leader in bringing novel medical technologies to the Department of Veterans Affairs (VA), Department of Defense (DoD), and Indian Health Services (IHS) medical treatment facilities. With the vast majority of epilepsy care delivered in the home, the SPEAC® System is uniquely positioned to help neurologists better help those who have served our country. Brain Sentinel, Inc., manufacturer of the novel SPEAC® System, proudly announces its entrance into the military healthcare market with the launch of its exclusive, federal, distribution partnership with Academy Medical LLC , a certified Service-Disabled Veteran-Owned Small Business. The partnership makes the SPEAC® System, a recently FDA-cleared Seizure Monitoring and Alerting System, available to the Department of Veterans Affairs (VA), Department of Defense (DoD), and Indian Health Services (IHS) medical treatment facilities. The SPEAC® System is the first FDA-cleared, non-EEG, physiological, signal-based system for seizure monitoring. 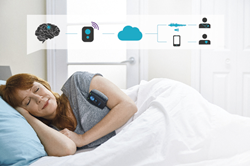 On February 16, 2017, Brain Sentinel received US Food and Drug Administration (FDA) de novo clearance to begin marketing the SPEAC® System, the Brain Sentinel® Seizure Monitoring and Alerting System. The adjunctive seizure monitoring system is indicated for adults at home or in healthcare facilities during periods of rest. A lightweight, non-invasive monitor is placed on the belly of the biceps muscles to analyze surface electromyography (sEMG) signals that may be associated with generalized tonic-clonic (GTC) seizures. It provides an alarm to alert caregivers of unilateral, appendicular, tonic extension that could be associated with a GTC seizure. The System records and stores sEMG data for subsequent review by a trained healthcare professional. ABPN board-certified epileptologist and Brain Sentinel cofounder José E. Cavazos, MD, PhD, added, ¨There hasn’t been a reliable and easy way to gather accurate and comprehensive seizure data to help guide proper treatment. Physicians rely on patient or eyewitness reports which have been shown to be unreliable. The sEMG biomarker is an exciting breakthrough because it reflects the activity of the primary motor cerebral cortex.” Harnessing the rich sEMG data through recording and in-depth analysis allows patients and their seizures to “speak” to physicians in a way not possible before. Seizure data gaps that existed before can now be addressed with long-term sEMG monitoring that records the time, date, audio, and the length of the tonic and clonic phases of the sEMG events. Most seizures occur during sleep and within the first two hours of wakefulness. 83% of those seizures aren’t documented. The collection of sEMG and audio information during a potential GTC seizure event makes the SPEAC® System a bimodal tool which may help treating physicians improve the diagnostic characterization of the events as well as objectively monitor success in moving patients toward treatment goals. Brain Sentinel, Inc. is a privately held medical device start-up based in San Antonio, Texas. The company manufactures and markets its sEMG-based System under the name, the SPEAC® System: the Sensing, Portable sEMG, Analysis and Characterization System. Brain Sentinel is committed to helping people gain better control over their seizures and be heard by their physicians. Academy Medical, LLC is a certified Service-Disabled Veteran-Owned Small Business specializing in providing innovative orthopedic implants, allograft tissue, wound care products and other medical devices. Having established a purchasing relationship with over 130 government facilities worldwide, Academy Medical’s expansive network delivers value through solutions that provide direct access to the multi-million dollar federal medical marketplace.